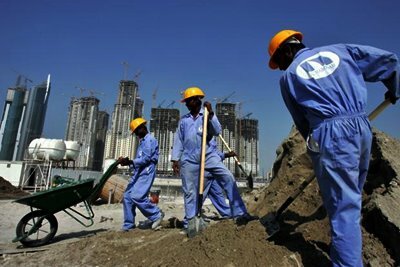 The UAE is creating an exclusive online portal for the recruitment of Indian workers under a memorandum of understanding [MoU] signed between the two countries during Indian Prime Minister Narendra Modi’s visit early this week, a senior official told. Dr Omar Al Nuaimi, Indian workers seeking jobs in the UAE will be able to submit their job applications and review terms and conditions of the job contract on this portal from India, said Dr Omar Al Nuaimi, Undersecretary of the Ministry of Human Resources and Emiratisation, and assistant for International Relations and Communications. This UAE system will be linked with India’s similar online system, eMigrate (an online system controlling emigration of blue-collar workers, qualified nurses and sailors), the official said. He pointed out that a joint committee will be formed to ensure the proper implementation of the MoU. The Ministry of Human Resources and Emiratisation will provide the Indian Ministry of Foreign Affairs with details of the available jobs in the UAE and their contractual terms and conditions. After the joint-technical committee completes the required technical measures for linking both systems, a specific procedure will be created. A model job offer and job contract will guide the workers to review the descriptions of jobs available on the system, the official said. Navdeep Singh Suri, the Indian Ambassador to the UAE, told that the integration of both nations’ systems is expected to be done in the next three to four months. “The MoU provides a much better framework for ensuring that Indian workers are recruited in accordance with principles of transparency, ethics and fairness. It endeavours to standardise contracts in a format that is in consonance with UAE laws so that workers can get due protection in the event of a dispute,” he said. A senior official at the Indian embassy told that the MoU will pave the way for abolishing contract substitution, a major problem faced by Indian workers. Unscrupulous agents in India give workers contracts with exaggerated salary and perks, but when they reach the UAE, a substituted contract takes the place of the earlier contract. As the substituted contract is legally valid, workers cannot redress their grievances. When the systems of both countries are integrated, workers will get a uniform job contract, without leaving any room for contract substitution. In 2015, India introduced eMigrate, an electronic system that controls emigration of ECR (Emigration Clearance Required) category passport holders. India issues ECR category passports to those who have not passed Grade 10 and hence they need emigration clearance before going to work in 18 ECR countries that include the Gulf nations. Recently, India brought sailors’ recruitment also under the purview of eMigrate, following complaints about sailors being mistreated and abandoned abroad. eMigrate was made applicable to qualified Indian nurses also when India banned their recruitment by private agents for overseas jobs since April 30, 2015. A Government of India order on August 2, 2016, further extended the ban to all female workers including domestic workers and authorised seven official agencies for the recruitment of all female workers including nurses. None of the 1,200 registered private recruitment agents in India is authorised to recruit nurses and female workers under ECR category. The embassy official said a protocol on domestic workers was also signed between both nations as an annexure to the MoU. This was needed as rules and regulations of domestic workers are slightly different from other workers, he said.